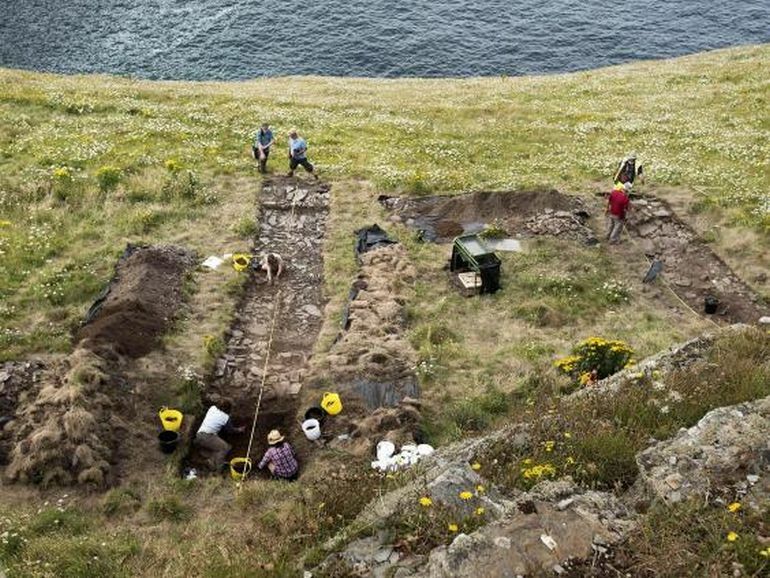 Archaeologists from the Cornwall Archaeological Unit (funded by English Heritage) have unearthed the structural remnants of what was probably quite an imposing Dark Age royal palace. 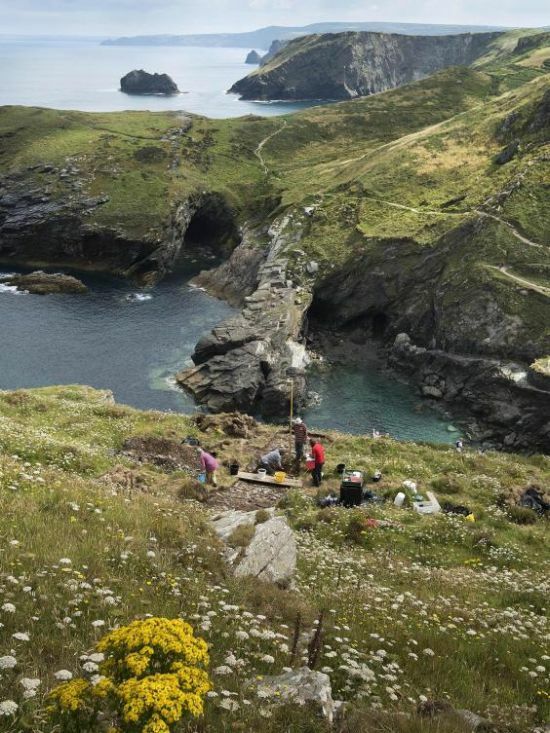 The discovery was made at the Tintagel Castle site, a striking area by England’s Cornwall coast that is often linked to the legends of King Arthur. To that end, even the preliminary findings from just four trenches have entailed 3-ft thick stone walls, complemented by steps and slate flagstone floors. These ruins date back to early 6th century AD, and were possibly constructed by the kings of Dumnonia, the Brythonic rulers who held sway over the most western parts of South West England, roughly between the time period of late 4th and 7th centuries. Now the question naturally arises – how does all of these relate to the legend of King Arthur? Well from the historical perspective, the legends of King Arthur were made famous by 12th-century writer Geoffrey of Monmouth, who mentioned all the popular tropes like Excalibur, Merlin and the Knights of the Round Table in his pseudo-historical account of Historia Regum Britanniae (‘The History of the Kings of Britain’). The chronicle, though often considered wildly inaccurate in terms of British history, puts forth the birthplace of King Arthur at Tintagel. The discovery of high-status buildings – potentially a royal palace complex – is helping to reveal an intriguing picture of what life was like in a place of such importance in the historically little-known centuries following the collapse of Roman administration in Britain. Now beyond fantastical coincidences and folkloric traditions, there is actual historical evidence to consider. In that regard, in spite of sensational claims made in the legends the King Arthur, the palatial stronghold was possibly abandoned simply because its inhabitants wanted to escape the bubonic plague that was transmitted from the Mediterranean lands. And since we are talking about faraway lands, archaeologists were pleasantly surprised by a fragment of a large bowl found inside the complex – with its origins determined to be from Anatolia (present-day Turkey). 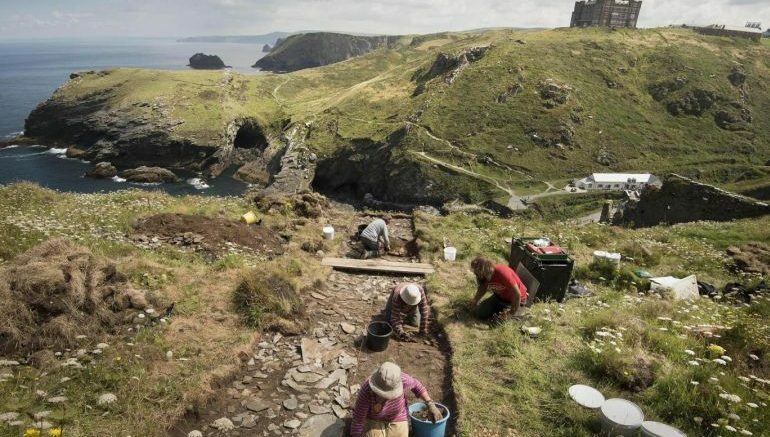 Suffice it to say, there is still much to unearth and assess at Tintagel, with archaeologists expected to conduct even bigger excavations at the site by next year. As for now, the connection between Arthur and the Dark Age royal palace is rather based on flimsy ‘conjectural’ grounds; though the project might shed more light on the often-overlooked Brythonic kingdoms that controlled parts of Britain between the late Roman and the Anglo-Saxon period – a vague epoch that fueled the semi-legendary statuses of characters like Arthur.